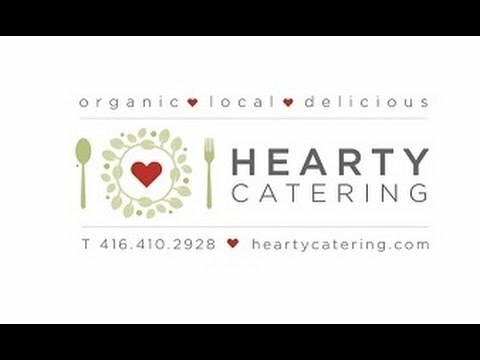 Hearty Catering has been "green" from our beginnings; our use of locally grown and organic food is a major component in creating our delicious cuisine. We are proud to feature the wholesome bounty of local farmers and producers in all our menus. By doing so, we have proven that delicious flavours and good nutrition result from a commitment to supporting local producers and a sustainable food chain. We choose local, organic, seasonal produce whenever possible. We adhere to a code of preparing only naturally and sustainably-raised meats and sourced seafoods. We select our ingredients from local farms and suppliers who emphasize organic and sustainable offerings. Our commitment is to offer nourishing, delicious cuisine that contributes to sustainable food systems and healthy communities. 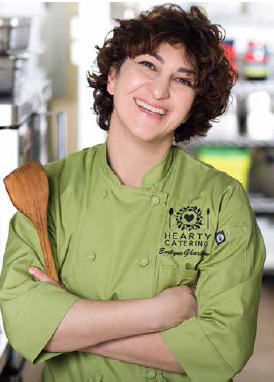 After spending a decade cooking and entertaining for family and friends, founder and Hearty Catering owner Evelyne Gharibian decided to bring the fusion cuisine she loved to a broader audience and started Hearty Catering. Hearty Catering started as a vegetarian catering operation, and has since grown to specialize in extraordinary meals that feature organic, local ingredients, including free-range and sustainable meat and seafood choices. Our international team contributes their knowledge and experiences to Hearty Catering’s offerings – and to the superb service we provide all our customers. We are proud to meet various dietary needs, and offer vegan, vegetarian, gluten-free and dairy-free dishes on our catering menus. Evelyne expresses the passion she has for creative, delicious yet wholesome foods through each event she caters. She and her dedicated staff will bring healthy and tasty meals to you and your guests, be it for a conference, lunch meeting, school event, wedding or party. Our chefs prepare all our cuisine from scratch, making all components of our meals from start to finish. Our clients reflect the diversity of the city that we live in. We work with film crews, school boards, schools and universities, nonprofits, socially-conscious businesses and individuals and families. Join our community of friends and clients and get in touch today. We choose local, organic, seasonal and sustainable produce wherever possible. We adhere to a code of preparing only naturally and sustainably raised meats and seafoods. We select our ingredients from local farms and suppliers who emphasize organic and sustainable offerings. Our business practices have been affirmed by our certifications by the Coalition for Canadian Farm Animals, Feast ON, Local Food Plus and Leaders in Environmentally Accountable Food Service (Level II). ONFC’s mission is to foster a sustainable food system. They do this by bringing to market products that are grown organically, locally, fairly traded and without the use of GMO’s. Products are sourced from companies who practice sustainability and who pay attention to the triple bottom line; economic, social and environmental. The Sosnicki family farm, located in Norfolk country, adheres to farming practices that contribute to the well-being and happiness of the soil, air, water, plant life, animals and people. We look forward to seeing them every Saturday at the Brickworks farmers market. Check out their amazing kale and homemade sauerkraut. Please drop us a line to provide a brief note about yourself, your interest in our company and a current resume. We appreciate all submissions, but only those candidates who have been selected following a telephone interview will be contacted and invited to a formal interview. We thank all applicants for their interest. Due to fluctuations in produce availability and prices, some ingredients may be subject to substitution and/or cost increase. We use fair trade, organic and local ingredients. All of our food is prepared fresh and by hand. We do this is an effort to contribute to sustainable food systems and the health of our communities. Our prices reflect this commitment to freshness, in-house preparation and fair compensation to local farmers and producers. Hearty Catering is pleased to bring our cuisine to your doorstep. 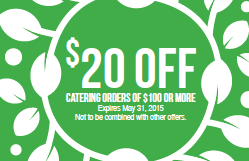 Delivery charge of $30 applies to all orders in GTA and includes next business day pick-up of service item. Please inquire for deliveries outside of the GTA. For orders under $1000, payment is due upon completion of catering service. Payment may be made by American Express, MasterCard, Visa credit cards, personal or business cheques, E-transfer or cash. Please indicate preferred method of payment upon confirmation of booking. If you are submitting your invoice to a corporate finance or accounts payable division, please do so upon completion of your catering service. For orders over $1000.00, a 50% deposit is due upon finalizing booking for catering. For orders over $1000.00, payment may be made by personal or business cheque or E-transfer. Please indicate preferred method of payment upon confirmation and booking. Balance is due upon completion of catering service. $500 or less – Hearty Catering requires notice of changes to the number of participants or menu a minimum of 3 business days from the event date. $500 - $1500- Hearty Catering requires notice of changes to the number of participants or menu a minimumof 4 business days from the event date. $1500 - $4000 - Hearty Catering requires notice of changes to the number of participants or menu a minimum of 5 business days from the event date. $4000 and up -- Hearty Catering requires notice of changes to the number of participants or menu a minimum of 15 business days from the event date. We recognize plans can change in an instant and try to be flexible in our cancellation policy. However, once we accept a catering booking we do not accept other orders so that we may meet our obligations to you. Our policy therefore strives to recognize your needs while protecting costs we may have already incurred. For orders of $1000 or less, we require 36 hours notice for cancellation. A 50% charge may be applied to late cancellations. For orders between $1000 - $4000, we request 10 business days notice for cancellation. A 50% charge may be applied to late cancellations. For orders valued over $4000, we require 4 weeks notice for cancellation.’’A 50% fee” may be applied to late cancellations. IF AN EVENT IS CANCELLED WITHIN 24 HOURS OF THE DELIVERY TIME, A 100% CHARGE MAY APPLY. 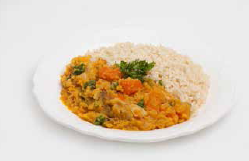 A plant-based diet comprised of vegetables, grains, legumes and fruit. Vegan foods do not include any animal-derived products. A plant-based diet comprised of vegetables, grains, legumes that may include eggs, milk and cheese. Vegetarian foods exclude the use of any animal protein. Gluten-free foods include many diverse whole grains that exclude the protein gluten, found in grains such as wheat, barley and rye. Gluten-free grains include brown rice flour, chickpea flour, gluten-free oats, amaranth, buckwheat, teff and millet produced in certified gluten-free facilities. Our dairy-free products do not contain any milk proteins including milk, cream, butter, yogurt, sour cream and/or cheese. Organic food is produced using agricultural methods that respect the natural environment. Organic food production enhances the health and vitality of the soil, preserves biodiversity, promotes animal welfare and preserves the ecological integrity of our environment. No synthetic fertilizers, pesticides or genetically modified organisms are permitted. Organic ingredients are certified by internationally recognized bodies. Sustainable food is healthful and nourishing for consumers and does not negatively affect the environment. Sustainable food respects consumers’ health, workers’ rights, animal welfare and farmers’ livelihoods. Sustainable food keeps the environment healthy and food production viable over the long term. Local food refers to produce, meat and other foods that have been grown within 100 miles of the consumer. Fair trade foods are produced in equitable, respectful partnerships with growers and suppliers. Fair trade partnerships contribute to sustainable development and protect the rights and livelihoods of producers and workers. Whole foods are foods that include unpolished grains, beans, fruits, vegetables, whole-fat dairy and clean meats. Whole foods do not include ingredients which have been processed or refined. Animals, including chickens, that have access to open floor space, perches and outdoor space. Eggs used at Hearty Catering in the Canadian spring, summer and fall are free-range. Chickens can roam freely in open concept barns. Eggs used at Hearty Catering in the Canadian winter are free-run. About 4 months ago from Hearty Catering's Twitter via Hootsuite Inc.